PALEMBANG - The government through PT Pertamina (Persero) is developing fuel more environmentally friendly. Producing fuel is environmentally friendly, according to Minister of Energy and Mineral Resources (ESDM) Ignasius Jonan has become an obligation as a citizen of the world and responsibility as citizen. "The progress or economic growth of this nation if only 5% per year, if we do not start making fuel environmentally friendly, then the pollution will be very bad for 25 years. Life expectancy is decreasing, "said Jonan, at the Plaju Refinery Complex, Palembang, Thursday (1/17). Pertamina is currently developing fuel more environmentally friendly. Jonan hopes besides being able to produce environmentally friendly fuel, it will also use 100% renewable energy raw materials. "The public hopes that the diesel oil produced by Pertamina later on, will come from renewable energy so that the level of pollution produced will be low, it will be greatly reduced because there is no pollution at all," hoped Jonan. 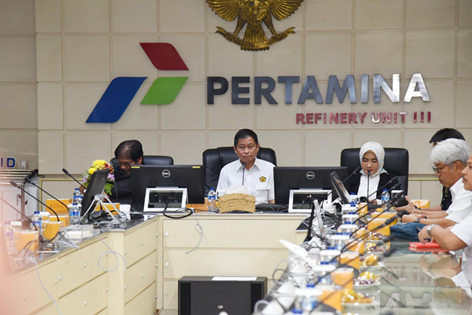 The President Director of PT Pertamina (Persero), Nicke Widyawati, said that Pertamina is currently developing palm oil-based fuels that are environmentally friendly. The development of the BBM was carried out in addition to the FAME blending as well as co-processing and hydrorefining. "Co-processing and hydrorefining will produce cleaner energy when compared to FAME which we produce today. The options for developing clean energy through the hydrorefining process are entirely the work of the nation's children as a result of collaboration with LAPI-ITB with the name of the catalyst Red and White, "Nicke said. Nicke added that the development of environmentally friendly fuels is being gradually being worked out at several Pertamina refineries and it is expected that before 2023 it can be implemented in four refineries owned by Pertamina that have Residual Fuel Catalytic Cracking (RFCC) which in time will produce green diesel, green avtur and green fuel.